Man is primarily a spiritual being, slowly unfolding from sense consciousness to spiritual awareness to a higher expression of manifestation. "In the beginning" man was created by God, in His "Image and Likeness," and from a state of innocent unawareness of any thought outside of God's Perfection, it would seem that he was, one might say, cruelly, placed in a position where he might be tempted from this innocent expression. There is scarcely anyone who has not looked back wistfully on days of happiness in the Garden of Eden and regretted Eve's surrender to the wiles of the "serpent," with its disastrous results, so far as her progeny is concerned. We are told that God warned our "first parents" of the danger of undue curiosity along the lines of thought and that it would be dangerous for them to experiment in individual thinking, short of the Love and Perfection which comprise the Nature of the First Cause, or Father. This warning they did not heed, and the moment the first act of will was performed outside of the Will of the Father, the fall of man took place and human nature was born, making man's first sin the one of disobedience. Man was created, in the first place, for a glorious Destiny. He was placed on a planet which took eons of time to prepare; placed there for his comfort and happiness. He was endowed with the Creative Powers of the Father and was given free will, all for the purpose that he may, as part and parcel of God's Life and Spirit, expand the Kingdom of Heaven, which was the Vision of the Father, without pain or suffering or death to himself, but in glorious cooperation with the great First Cause, the only existing Mind in the whole universe. It must also be remembered, in line with the gift of free will, that no soul ever incarnated upon the Earth unless he first volunteered for this opportunity to evolve his Creative Powers. Through the fall, these sons of God created a realm for themselves outside the Kingdom of Heaven and, in time, became wholly human, having developed a nature entirely alien to the Divine Nature of the Father God. Not every incarnated spirit took part in this willful disobedience of independent thinking. There were thousands upon thousands who remained true to the Will of the Father, fulfilled their individual, Divine Destiny and returned Home to the Heart of God, with their Creative Powers developed in Love, Wisdom and Discrimination. 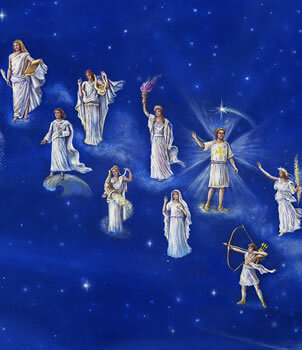 Many of these Faithful and Obedient Ones volunteered to return to the planet they had just left, to try to turn their erring, and now suffering, brethren from the downward path of separate and individual desire. They were fortunately successful in awakening some, who were wise enough to heed Their promptings. These Grateful Ones, also, on returning to the Kingdom, joined what is known as the Great White Brotherhood, an organization comprised of every Liberated Spirit who ever trod the Earth, as well as all the members of the Heavenly Host directly concerned with the evolution of this planet and beneficent members from other planets who were interested in our welfare. This article by Mary Innocente, the mother of Geraldine Innocente, was originally published in the September 1952 The Bridge to Freedom Journal. She gained Immortal Freedom in the Victory of the Ascension, reuniting with her "I AM Presence" on March 7, 1960 - becoming the Ascended Lady Master Dawn.